But the PTC makes them VERY worthwhile to businesses looking for tax write-offs. Before it went bankrupt in 2003, Enron was the country's largest owner of windmills. Later it was supplanted by the Marriott Hotel chain. A major corporation looking for tax advantages can make money from windmills without ever generating a kilowatt of electricity. 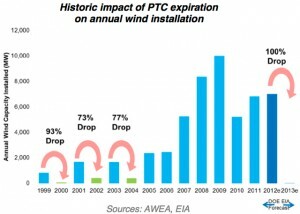 It is time to put the faux environmentalist chimera of big wind energy out of the US' misery. It may be too late for Europe to save itself from the monstrous economic debacle of big wind. But the UK can still save itself. Beware of politicians bearing gifts of big wind, big sun, and carbon credits. Do what you must to preserve the future for yourselves and your progeny.